Join me for a day of stillness amidst the festive buzz. Explore asana, meditation, chants, gentle ritual and yoga nidra to allow you to honour and connect with the energy of Midwinter. At the winter solstice, the sun has its lowest arc in the sky creating the longest night and shortest day of the year. Our ancestors believed the mystic wheel of Time stopped turning briefly at this crucial point as one cycle ended and a new cycle of the Sun began.Let us take a moment to stop , to look backwards in inner reflection and to look forward to a new sun’s returning power. 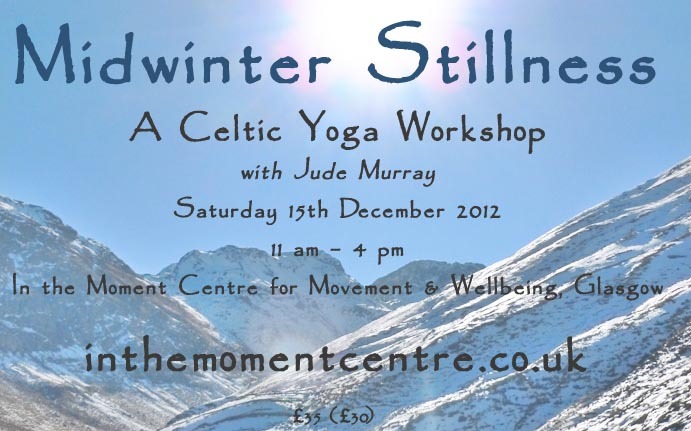 The cost is £35 (£30 for previous Celtic yoga attendees and concessions) Energetic exchanges considered. Booking Essential. Contact me – mahashaktiyoga@gmail.com to book your space.